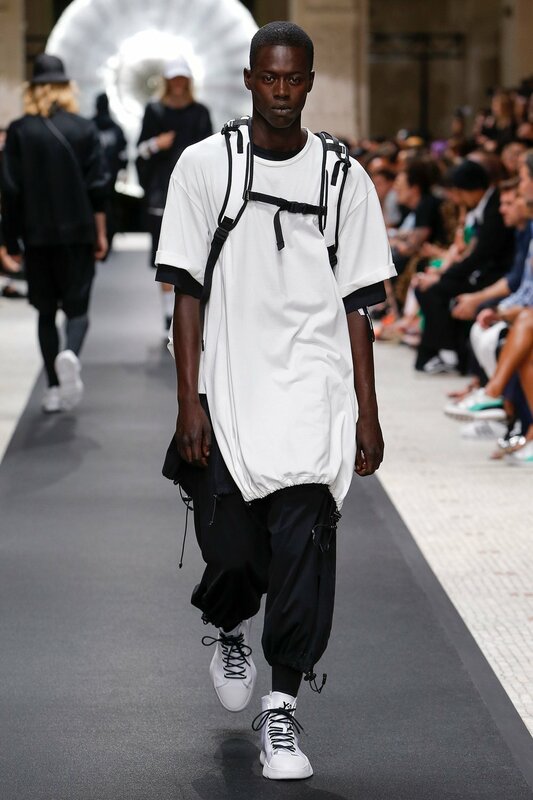 As trends push forward and the influence of streetwear and techwear begin to melt into the difficult world of high fashion, beautiful collections such as Y-3’s Spring 2019 runway demonstration display their dominance. A mix of over-sized shirts and pants colliding with intricately designed backpacks and footwear, the larger public appeal of new styles merging into high-end fashion has become more accessible as time goes on. Zara’s Basic Regular Fit T-Shirt ($10) will provide you with the striking simplicity of Y-3’s spring looks while freeing the shopper up to layer-based experimentation. In order to match the full vibe of the outfit, try mixing in a pair of baggy pants to compliment your over-sized T-Shirt and shake up a sense of perspective. You can make a full outfit by purchasing Zara’s Jogging Pants With Pockets ($50), a perfect compliment of your straightforward white tee. A key accessory of Y-3’s Spring showcase was a beautiful white backpack with complimentary black stripes. To achieve a similar look, go for Zara’s Cream White Leather Backpack ($199) to help tie your outfit together. Sophisticated in its design and timeless in its color, this cream backpack will serve you well from the workplace to the streets of Manhattan. Shoes can say a lot about a man, and you’ll want yours matching the futuristic look you’ve accumulated thus far. Splurge on Zara’s White Padded Hi-Top Sneakers ($60) to finalize your look. In the same family as the military boots dominating the fashion landscape today, these pair of kicks will serve you as a more versatile piece to your personal collection. Must Have: As we dig deeper into Gucci’s Fall/Winter 2018 collaboration with the New York Yankees, we’re treated with an opulent take on the iconic baseball dynasty’s signature cap. Featuring the same historic monogram-spread design best known for the high end brand’s handbags, the NY Yankees Edition GG Supreme Patch Cap is a beautiful take on Gucci Creative Director Alessandro Michele’s mission to bridge the gap between an iconic sports team and an iconic brand. Feeling vintage in its appearance, the cap will stay on tight with its adjustable back tab and internal brow-band to help cater to a one-size-fits-all design. If you are a fan of the famous sports team or have a respect for NYC culture in general, this is an absolute must grab. A conversation starter from multiple ends of the spectrum, donning this piece will make you turn heads for all the right reasons. A large Yankees emblem attached to the front, this accessory will run you approximately $320 USD. You can purchase the Gucci/NY Yankees Edition GG Supreme Patch Cap now at retailer Mr Porter. Industry Update: Have you ever seen a luxury item and thought, “I could do better than that”? Well, now is your chance. Available at participating stores globally, Louis Vuitton is now allowing their shoppers to customize their own “Run Away” model shoes in any way they see fit. Customers can choose from a multitude of different colors, materials and stripes to create a shoe that best fits their own personal style. Users may even add the classic Louis Vuitton Monogram for that sweet, sweet brand recognition as well as their own personal initials which can be hot-stamped or printed. The full list of participating stores is available on Louis Vuitton’s site, but notable standouts include the classic Maison Champs-Élysées shop in Paris and Fifth Ave. in New York.